If you told someone 30 years ago that you spotted a bald eagle in Maryland, they’d be impressed. But these days, that’s not the case. The bald eagle population has increased dramatically over the years. That’s prompted Maryland wildlife officials to propose removing the bird from the state’s list of threatened species. Only 44 breeding pairs of bald eagles were found in Maryland in 1977. In 2004, the population rebounded to 390 pairs. According to Gwen Brewer, science program manager for the Maryland Department of Natural Resources’ Natural Heritage Program, that number may be over 500 now. “The breeding population in Maryland alone has exceeded recommended goals for the entire Chesapeake Bay area, so it's really been a success story,'' Brewer said. According to Brewer, the two main reasons for their rebound are the ban of the pesticide DDT, which caused the bald eagles eggs to become thin and brittle, and improving water quality that has provided more food. 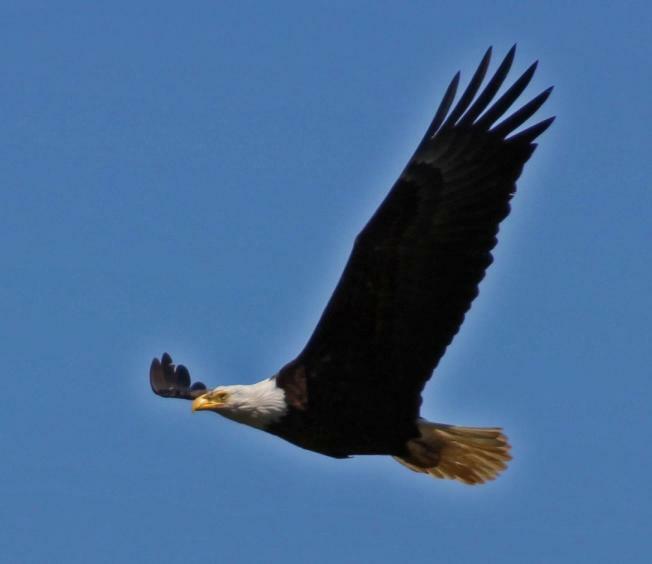 Bald eagles are now found throughout the state, mostly concentrated around the bay with the largest populations in Dorchester and Charles counties. The federal government removed the bald eagle from its list of threatened species in 2007. Brewer said Maryland officials review their lists about every two years and issued their last update shortly before the federal decision to remove the bald eagle. The DNR is accepting public comments on the proposed change until February 16. If no objections are raised, the DNR secretary is expected to approve the removal. The DNR is proposing that the Bridle Shiner, a small fish, be listed as extirpated, or no longer found, in Maryland. It’s also proposing that insects, including the Elfin Skimmer, Appalachian Snaketail and Treetop Emerald, be placed on the endangered species list.